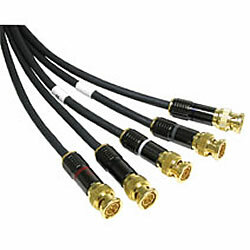 The preferred cable for uncompromised performance in high-definition RGBHV video applications. True high definition video cannot be accommodated in the analog domain on a single cable. RGBHV component video interconnects are the industry standard for delivering the full measure of performance. SonicWave™ Component Video Interconnects by Impact Acoustics ensure state-ofhe-art performance through advanced cable design, construction and materials. Silver-plated oxygen-free copper center conductors and nitrogen-foamed PE dielectric combine with Cu Shielding Technology™ and 24K gold-plated connectors to provide a lifetime of dependable performance. Precise construction techniques maintain characteristic 75-ohm impedance, and guarantee maximum signal fidelity. Don’t compromise your high-definition or extended definition signal; use the right interconnects! Impact Acoustics SonicWave component cables are the right choice when performance matters!